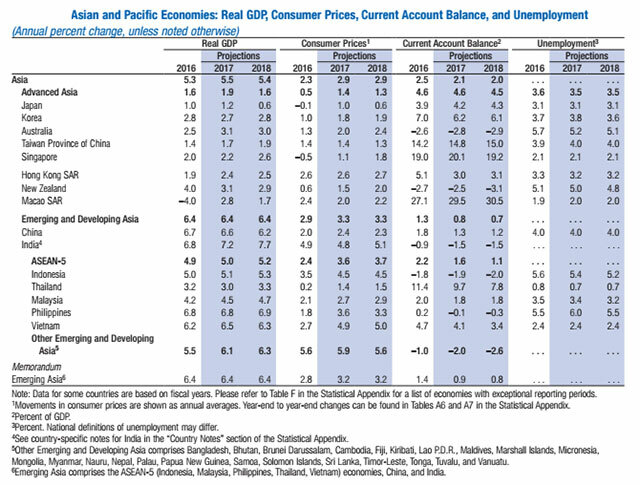 Forecast contained within World Economic Outlook released on April 19. Vietnam’s GDP growth in 2017 has been projected at 6.5 per cent and CPI 4.9 per cent in the IMF’s World Economic Outlook (WEO) released on April 19. Economic activity is forecast to accelerate slightly this year in four of the ASEAN-5 economies: Indonesia, Malaysia, Philippines, and Vietnam. The fifth, Thailand, is projected to recover from a temporary dip in tourism and consumption in late 2016. Growth in 2017 is projected to be 5.1 per cent in Indonesia, 4.5 per cent in Malaysia, and 6.8 per cent in the Philippines. In these economies, the near-term pickup in growth is underpinned to a significant extent by stronger domestic demand and, in the Philippines, by higher public spending in particular. Meanwhile, the World Bank’s recently-released East Asia and Pacific Economic Update forecasts Vietnam’s growth at 6.3 per cent this year and believes that growth will improve gradually during 2017-2019, driven by robust domestic demand and export-oriented manufacturing. The WEO raised its projection for 2017 global growth to 3.5 per cent, up from its recent forecast of 3.4 per cent. IMF’s 2018 forecast holds steady, with global economic growth set to rise to 3.6 per cent. The expected growth improvements in 2017 and 2018 are broadly based, although growth remains tepid in many advanced economies and commodity exporters continue to struggle.